An indoor houseplant guaranteed to give you instant impact in any room. Easy to grow in bright sunny room. The parlour palm is back! This classic houseplant has never really gone out of fashion and today is even more popular than ever! 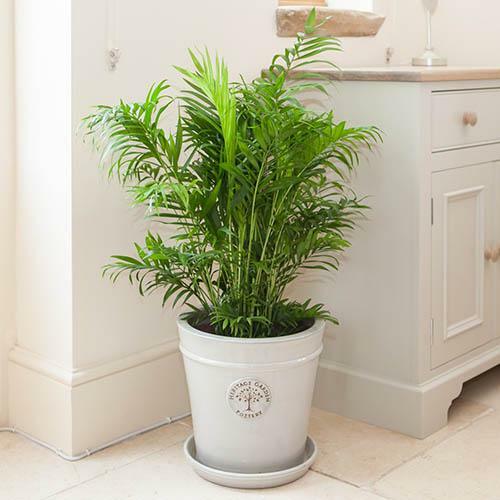 Areca is an instantly recognisable indoor palm and a favourite houseplant. Easy to grow and suitable for all levels of experience, palms make an ideal gift for anyone who hasn't got outside space to garden. As well as being a great plant to brighten up your indoors, the Parlour Palm is well known for helping keep the air in your home clean as it filters out pollutants keeping it fresh and clean - according to a NASA study, it can remove formaldehyde, xylene, and toluene, found in furniture, fireplace smoke, and common household products. Supplied as a mature plant in a 24cm pot, approx. 120cm tall from the base of the pot.